Sheet pan chicken and broccoli with bell peppers and Parmesan cheese makes for an easy, hands-off healthy dinner! Serve alone for a low-carb meal or pair with steamed rice or a baked potato. Happy hump day friends! I hope you are having a good week… it’s always tough coming back after vacation, isn’t it? 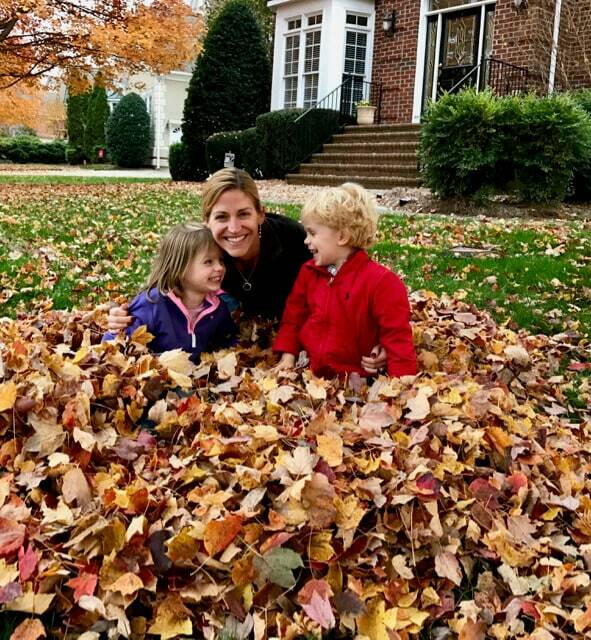 Also lots of playing in the leaves, raking them up and making big piles for the kids to jump in, which makes my heart happy. In other news, I can’t believe tomorrow is December 1. I mean, I can. I’ve got Christmas decorations pulled down, we’re setting up our tree, the kids are talking Christmas and Santa non-stop and we’ve got my in-laws coming for the first of two visits this weekend. One of my rules amid all the holiday craziness is to keep things as simple as possible as much as possible. But just a random weeknight? 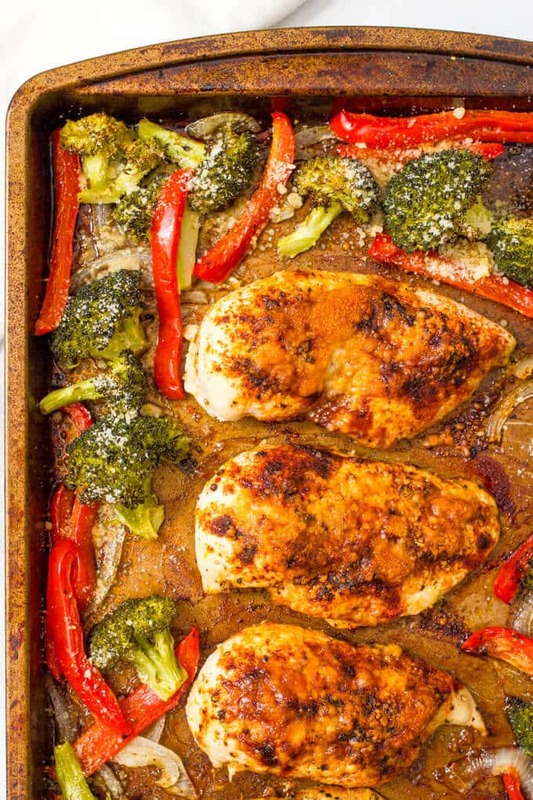 Hello, sheet pan dinners. I’ve made you a couple sheet pan dinners before… my salmon, potatoes and asparagus sheet pan dinner and my one-pan roasted chicken and vegetables. 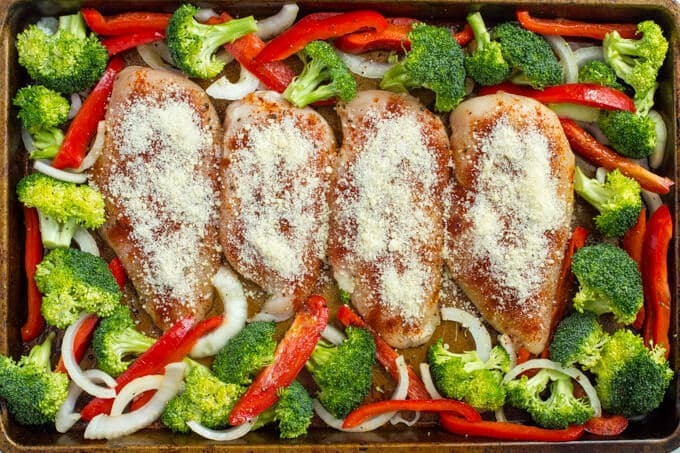 I love that you can load up one or two sheet pans, throw them in the oven and dinner is set. I can go read books with the kids, sort the laundry that I’ve inevitably left in the hallway outside the laundry room or just catch up on emails. 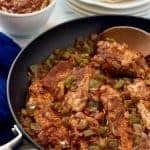 This recipe is low-carb and gluten-free as is, but you could certainly serve it with steamed perfect brown rice or a quick 10-minute microwave baked potato. 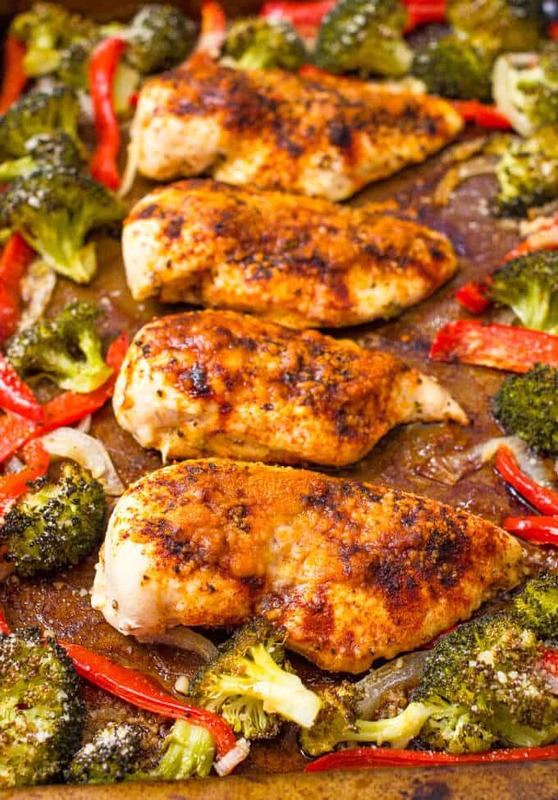 You could also put cut up Yukon or red potatoes on another pan and roast them in the oven at the same time as the sheet pan chicken and broccoli. You can skip the onion if you prefer. I love the flavor it adds and I actually love eating roasted onions with the other veggies, but I know it’s not everyone’s thing. I used a red bell pepper here – that festive thing again – but you could use another color if you prefer. I sprinkle the Parmesan on the veggies at the end, so it just melts, but you could add it before roasting if you want it to get more crusted on. 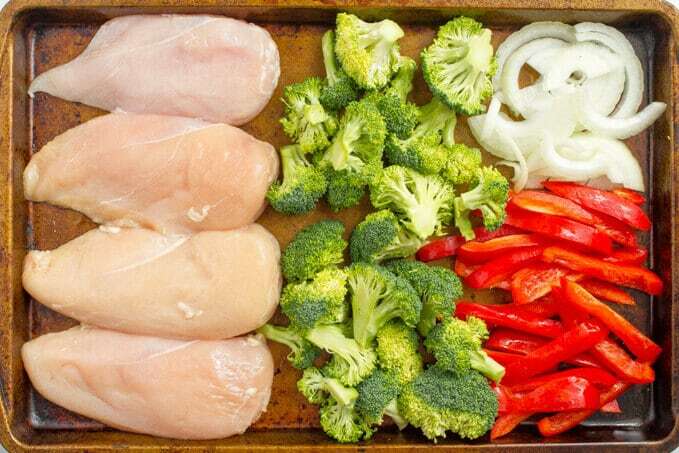 Parmesan chicken with broccoli and bell peppers makes for an easy, healthy sheet pan dinner! 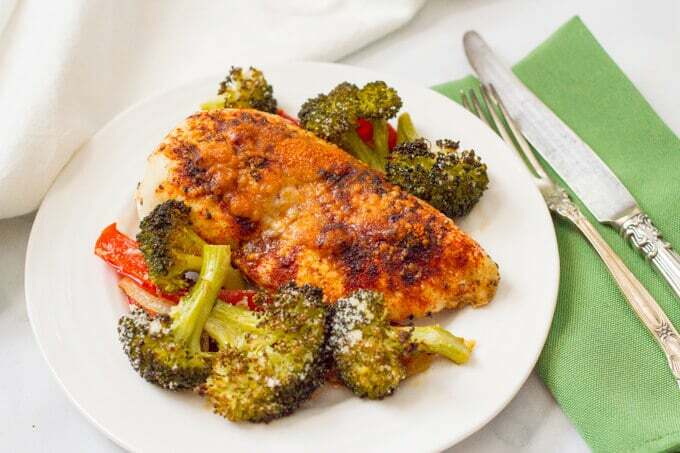 Prepare the chicken: Rub chicken breasts with 1 teaspoon olive oil and season with paprika, salt, black pepper and garlic powder. 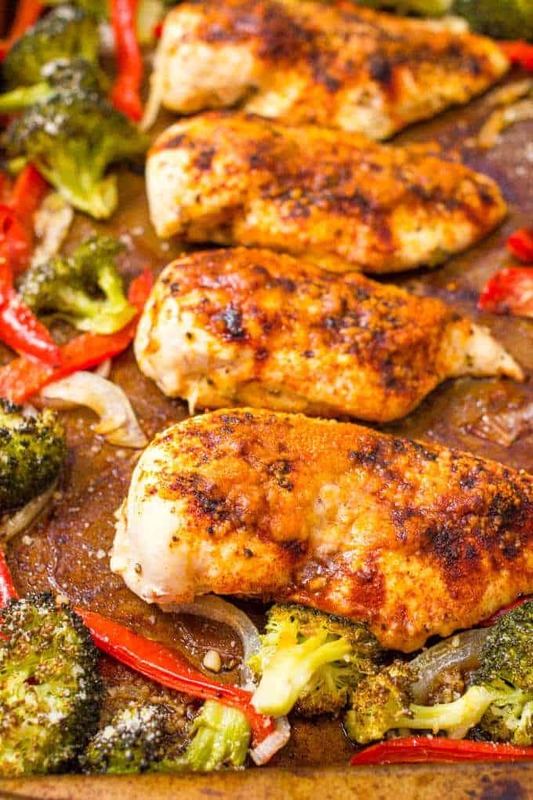 Place on a large rimmed baking sheet and top each chicken breast with 1 tablespoon of grated Parmesan cheese. Next, combine the broccoli, peppers and onion in a large bowl. Add the 2 teaspoons of olive oil and the salt, pepper and garlic powder and toss to get everything well coated. 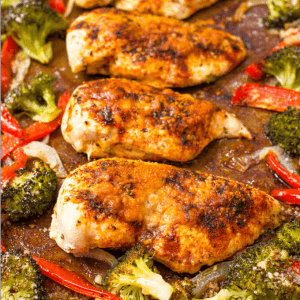 Spread the vegetables in a single layer on the baking sheet around the chicken (or use a separate baking sheet if it’s too crowded). Roast at 400 for 30 minutes, or until chicken is cooked through. Sprinkle the vegetables with the remaining 1/4 cup Parmesan cheese and serve hot. You can skip the onion if you prefer. I used a red bell pepper here, but you could use another color if you prefer. Excellent, I hope you do Luci! It’s a great go-to recipe! I fixed this tonight & Wow was it a success!!! Already been asked to fix again Soon!!! 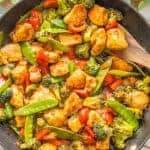 Quick, easy, & delicious!!!! Sent a picture to my daughter of completed meal & my son-in-law thought we were at a Restaurant!! Just stopped by to thank you for sharing this recipe with us. 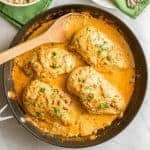 I made it tonight and it was delicious – my husband loved it!!!! 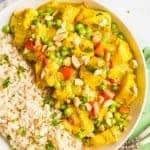 It is a bit hit in my household and you can be sure that I’ll be making this again. Just discovered your website today from Texanerin’s post on Facebook. We tried this tonight and it was fantastic! The chicken was so moist and juicy and the veggies came out perfect. Such great flavours. Will definitely be making this lots of times. So easy cleanup too! Bonus! I can’t wait to try lots of your other recipes too. So many good ones. Trying to find a way to use up a bell pepper, I ran across your recipe. Oh my! 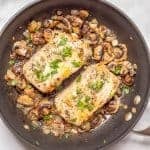 One of the easiest meals to make, but so good. We added some shredded mozzarella right before it was finished (on the chicken). How about freezing left over portions? Hi Beverly! You certainly can freeze the leftovers, but I find that leftover cooked veggies can sometimes turn soft after freezing and reheating. And in some cases, get a bit mushy, so just be aware of that. The chicken should be fine. 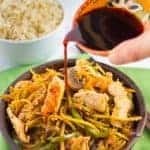 But you could always reheat and make it all into a stir fry or something where the veggies are generally really soft anyway. Hope that helps!